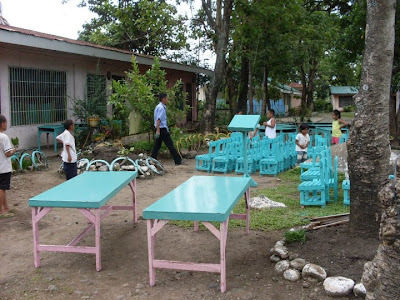 June is the school opening in the Philippines. Every last week of May or first week of June the community is involved voluntarily to help the teacher of their children. The Public School Teachers have the responsibility to make their classrooms conducive to learning. 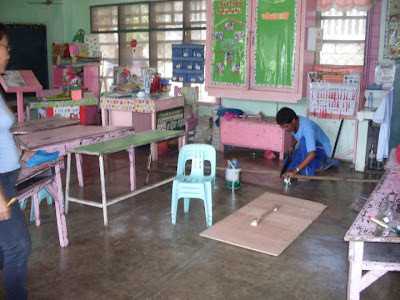 They have to provide anything that is needed in the classroom at their own expense. Having these parents who give a helping hand to the teacher is truly a big relief! 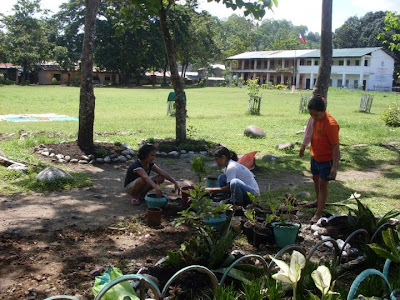 Most of the public schools in the Philippines have no gardeners. So, teachers took charge of their own backyard. These parents are good landscapers too. Teachers do not need one because here they are showing their skills in doing the curve appeal! If the classroom doorknob disfunction or the bathroom won't flush, teachers will fix it. Teacher's are the handy person inside the classroom. That is why, when parents volunteered to do the handy job, the teacher can focus teaching.